Her father was a tailor and the first fifer for a Lorraine Regiment but who yearned for a life of showbiz and eventually lived his dream in a small theatre in Bayeaux, he conducting the orchestra, his wife playing the soubrette roles. When their daughter was old enough, she too wound up on the boards. Well, that’s one way to look at it. He did send Mlle George a great deal of money and although the record is silent on what, if anything, he got in return, we do know that he and his wife went off into a kind of exile in Italy; political reasons are usually cited. If Mlle George was unduly upset – and she does not appear to have been an overly sentimental woman, despite her trade – she seems to have gotten over it quickly enough. She was soon to be seen on the arm of Prince Paul Sapieha of Poland, who set her up in a pleasing apartment at 234, Rue Saint-Honoré and left a housewarming pile of expensive clothing and serious jewels. A bagatelle, in tribute of her art. The critics largely credited her success to her looks, or perhaps it was merely star quality; impossible to know, of course, but whatever it is that makes men go nuts, she clearly had it. In 1803, she was mistress to Napoleon himself. When the first consul appeared at her performance of Racine’s Cinna, she turned to him in act five and uttered the immortal lines: “Cinna is at my feet, others will kneel there yet.” And the crowd went wild, with the exception of Josephine. For her it was off to a financier who gave her an even better apartment, and more appearances on stage. Money was a problem, too easily come by, too easily lost, and in time she found she had more debts than she could easily pay back. She skipped town, and didn’t stop until she reached Russia, where she was warmly welcomed by high society, and where she may or may not have been entertaining an offer of marriage from George Benckendorff, one of the lesser lights of the Benckendorff family. Instead she (allegedly) became mistress to Tsar Alexander 1st and found a well paying gig at the Imperial Theatre in St. Petersburg. Once Napoleon invaded, things French went briefly out of fashion, and when the populace was told to light candles to celebrate the Russian victory at Borodino, she is French enough to refuse and indulged enough to be forgiven. “A good French woman”, as the Tsar put it, and told the more easily shocked to leave her alone. With peace in Europe, she traveled widely and performed wherever possible, and in 1830 managed to talk Dumas pere into writing a play for her about Bonaparte. Given the poor treatment the emperor had given Dumas’ father, this is evidence of near superhuman browbeating. In middle age she took up with strange impresario/playwright/journalist Jean Charles Harel, a man known for dazzling conversation, directorial skills, a talent for extracting money from the rich and a poor understanding of how to employ it, much less pay it back. He was also famous for his appalling personal hygiene (which given the period is saying something) and for Piaf, his pet pig, on whom he lavished unseemly affection and who was permitted to sleep on his bed. The pig eventually went the way of the butcher block, albeit behind Harel’s back, and though Harel wept, he was mollified by the sausages and bacon. Whether his own profligacy on stage matters or backing Georges’ personal extravagances, he could not keep up with the dunning notices and went bankrupt in 1840. By now the piles of jewels were a memory. She went off to play the provinces, he drifted off into madness and in 1846, to his death. She managed to cadge a small pension from Napoleon III, but it was irregular in coming, and her letters on the subject make for unhappy reading. All things are relative, of course, and though her final years were lived in greatly reduced circumstances, she was not utterly destitute. 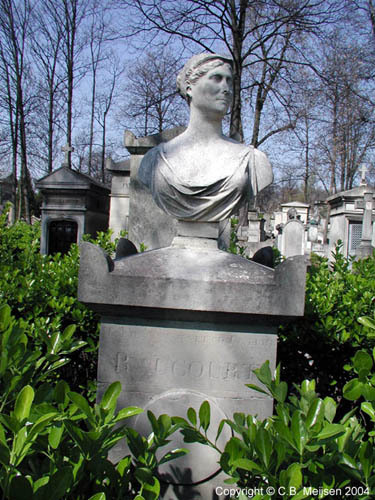 She is buried in Pere Lachaise, along with Harel and down the way a bit from Mademoiselle Raucourt which is appropriate given the life she laid. That bill at least was picked up by Napoleon III. She wrote her memoirs in due course, which can be read here if you have French (they cut off abruptly just before she decamped to Russia). * “The Duke was the stronger man.” The origin of this anecdote are suspiciously murky. If anyone has better luck than I have had in nailing it, I would love to hear from you. This entry was posted in Actor, Adventurer, Entertainer, Patriot, Writer and tagged Alexander Dumas, Bernadotte, Cinna, Duke of Wellington, George Beckendorff, Jean Charles Harel, Jerome Bonaparte, Lucien Bonapart, Mademoiselle George, Mademoiselle Raucourt, Napoleon III, Prince Paul Sapieha, Racine, Tsar Alexander 1st by BWA. Bookmark the permalink. Is “immoral” a typo for “immortal” here? Yikes! That’s why the world needs copy editors. Thank you for Mlle George – don’t think I’d heard of her before – a remarkable lady indeed. One typo I noticed: Beckendorff should read Benckendorff. Yikes, right you are, and thanks for mentioning it. Fixed accordingly.